Meretz MK tweets army order preventing provocation; 'law-and-order champions' leave buses and proceed on foot; developing. Following yesterday's report of an organized tour of Jewish Jordan Valley-area outposts planned for today (Friday) to "stop the outpost thugs", MK Zahava Galon (Meretz) tweeted an order issued by army Central Command General Roni Numa, forbidding the group from approaching the "Baladim" outpost, the real goal of the provocation. 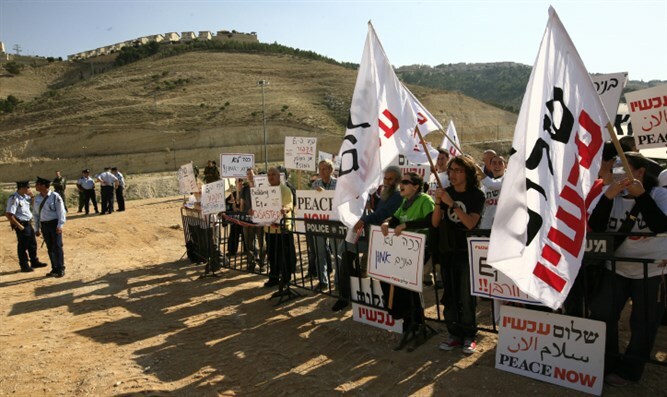 "OC Central Command Roni Numa issued a closed military zone order that prevents hundreds of @PeaceNowIL activists from entering the Baladim outpost for a tour. Not that it's forbidden to enter, just not us," Galon tweeted. In reality, the Baladim outpost has been the subject of various such military orders for at least two years, due to the sensitivity and strategic importance of the area to future Jewish sovereignty. Later, another Peace Now believer who calls himself "Carmel Dangor" tweeted a photo of hundreds of left-wing agitators marching on a gravel path that appears to match Baladim terrain, with a caption saying that because buses are prevented from reaching the area, they are making their way to Baladim on foot. The tweet was removed minutes after posting. Baladim residents are unperturbed, reacting to reports they may be overrun by leftist agitators with grim stoicism, expressing their desire to attend to their agricultural activities. Earlier today, it was reported that Galon had besmirched Jewish residents of Judea and Samaria with a bizarre and totally fabricated accusation, claiming “settlers” had committed “pogroms” against left-wingers, Arabs, and even the IDF. This story is developing. Arutz Sheva will provide updates when they become available.